2435 / BERLIN - 1948 / 90, complete collection with all issued stamps, predominantly mint never hinged formed in the lighthouse hingeless illustrated album. With also black overprint expertized Schlegel BPP, red overprint expertized Lippschütz respectively Schlegel BPP, Stephan set (top values expertized Schlegel BPP), buildings 1949, Goethe set, green overprint, monetary sovenier sheet and all further issues. Favorable opportunity! 2437 ⊙ BERLIN - 1964 / 90, a particularly beautiful used collection, almost all issues with lovely centric postmarks in the KABE hingeless illustrated album including the postal stamps, welfare and youth sets and so on. In this kind an exception object, there especially the issues the sixties years so nice centric cancellation rare to be on offer! 2472 FDC BERLIN - nice and rich collection from First Day Cover the early issues in the ring binder formed. With also two buildings se-tenants 1949 on First Day Cover, 10 Pfg. And 30 Pfg. Bell left on illustrated First Day Cover, as well officially First-Day-Covers from the fifties with useful issues, as well 17. June 1953, 10 Pfg. And 20 Pfg. Memorial church, different values buildings 1952 / 53 and further special- and commemorative issues, 3 DM congress hall 1958 on illustrated First Day Cover and so on. A very nice object! 2473 x BERLIN - extensive inventory packed in a carton with a lot of material, with also black overprint set, 10-20 Pfg. Monetary reform vitims, all three Freedom Bell sets mint never hinged, philharmonic twice, red overprint set, Goethe set, monetary reform vitims set, all issues from 1950 / 54 and much further material. Perfect for liquidation, favorable valued! 2475 BERLIN - 1949 / 90, very nice and mint never hinged collection in two Lindner hingeless printed form ring binder with numerous good issues, as well Stephan set 1949, green overprint, Goethe set, monetary reform vitims set, as well the years 1950 / 90 complete with ERP 1950, Lortzing, philharmonic, all Freedom Bell sets and so on. A magnificent object! 2478 /⊙ BERLIN - 1948 / 90, nice and extensive inventory in two large thick stock books accommodated with a large amount of material. With also black overprint 1948 mint never hinged expertized Schlegel BPP, Goethe 1949 mint never hinged, ERP 1950 mint never hinged, philharmonic mint never hinged (key value twice and once again used), Lortzing mint never hinged and used, bell left mint never hinged, Day of the Postage Stamp 1951 mint never hinged, bell right mint never hinged and used, Beethoven twice mint never hinged, bell middle twice mint never hinged, 70 Pfg. Green forest mint never hinged and numerous further better issues, welfare and youth sets and so on. A more cultivated inventory! Michel approximate 10000,- €. 2538 / BERLIN - 1948 / 59, rich collection in a large stockbook, predominantly mint never hinged formed with all better issues. With also black overprint expertized Schlegel BPP, red overprint expertized Schlegel BPP, Stephan set expertized Schlegel BPP, buildings 1949 (better values expertized Schlegel BPP), Goethe set, green overprint expertized Schlegel BPP, monetary reform vitims set expertized Schlegel BPP, philharmonic, ERP 1950, Lortzing, all Freedom Bell sets, men 1952, 70 Pfg. Green forest and so on. Favorable! 2539 FDC BERLIN - 1950 / 62, very nice and rich collection from illustrated First Day Cover in the ring binder with numerous good issues the early years as for instance ERP 1950, philharmonic, Lortzing, 10 and 30 Pfg. Bell left, Day of the Postage Stamp 1951, Beethoven, memorial church as set franking on illustrated First Day Cover (rare! ), 17. June 1953 and many further better issues from the fifties and so on. With also 1 DM Great Elector, 3 DM congress hall and so on. A wonderful object with very high catalogue value! 2602 BERLIN / buildings - wonderful mint never hinged special collection from se-tenant with plate flaws the buildings issue 1949 and 1951 in the Lindner ring binder. As well scarce examples, good combinations, gutters, stamp booklet panes and so on. A magnificent object, like it in this variety pretty much never to be on offer can! 2603 BERLIN - 1948 / 54, high-value mint never hinged lot of the early years in a large stockbook, as well black overprint stamps, red overprint twice, Stephan set, building values 1949 including 5 DM, monetary sovenier sheet twice and so on. Favorable valued! 2604 BERLIN - 1948 / 70, complete mint never hinged collection, clean and maintained in the KABE-Album formed including all early key values. With also black- and red overprint series, Stephan set, buildings 1949, Goethe set, green overprint, monetary reform vitims set, monetary sovenier sheet, philharmonic, all Freedom Bell sets and so on. Favorable opportunity! 2605 FDC BERLIN - 1950 / 86, very nice and extensive collection of lovely illustrated First Day Cover in five thick Lighthouse-albums formed with numerous sought-after issues. As well better officially First-Day-Covers from the fifties including ERP 1950, Lortzing, philharmonic 1950, 10 Pfg. And 30 Pfg. Bell left, Day of the Postage Stamp 1951, Beethoven, Before Olympic Games 1952, 10 Pfg. And 20 Pfg. Memorial church and a great many further issues, special- and commemorative sets, welfare and youth sets and so on. An extensive object with lots of material and enormous catalogue value! 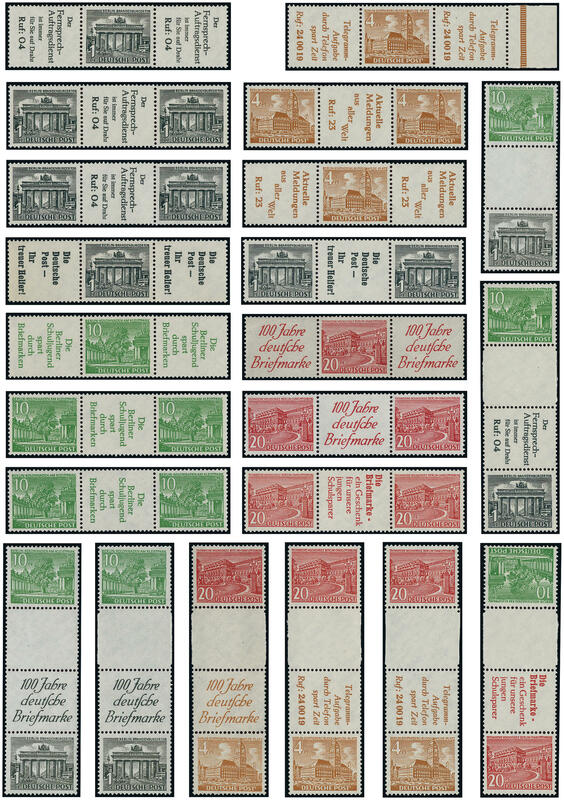 2664 /⊙/ BERLIN - 1948 / 90, rich collection, nearly complete in two Lindner hingeless printed form ring binder. As well black overprint mint never hinged (Mark values from upper margin), red overprint used, Stephan set used, buildings 1949 mint never hinged, Goethe set, green overprint, monetary reform vitims set, all bells issues, philharmonic and many better issues, complete years and so on. Favorable! 2665 /⊙/ BERLIN - interesting and extensive inventory of the se-tenants in a large stockbook, from the buildings issue formed, as well better combinations, as well also the further se-tenants extensively present including a beautiful part sights. Subsequent still numerous horizontal pairs and blocks of four from postal stamps including corners of the sheet, as well coil stamps. Favorable valued inventory with enormous catalogue value! 2687 BERLIN - 1948 / 90, very nice mint never hinged collection, with numerous good issues of the early years in the safe hingeless illustrated album. With also various black overprint stamps, red overprint sentence, 1 DM Stephan expertized Schlegel BPP, Goethe set, as well the issues from 1950 / 90 complete including ERP 1950, philharmonic, all Freedom Bell sets and so on. Michel approximate 4600,- €. 2695 x BERLIN - interesting inventory packed in a carton, as well a rich collection including black overprint mint never hinged, all Freedom Bell sets mint never hinged, ERP 1950 mint never hinged, Lortzing mint never hinged, philharmonic mint never hinged, men 1952 mint never hinged, interesting part se-tenants with useful combinations buildings and so on, whereby the early issues often double are present. Very favorable! 2697 x BERLIN - interesting inventory packed in a carton with issues on albums and stock pages. Also the Mark values black overprint, monetary reform vitims set, monetary sovenier sheet 1949, philharmonic, as well numerous further issues, complete sets and so on. Favorable! 2698 x BERLIN - extensive inventory in 10 large albums / stock books, as well numerous first issues from the overprint value, philharmonic, bell stamps, enormously much mint never hinged material and so on. Favorable valued inventory with gigantic catalogue value! 2729 x BERLIN - extensive inventory from mint never hinged issues packed in a carton, mostly in sheet and parts of sheets, with also 7 Pfg. Heuss medallion as original coil to 1000 values mint never hinged (Michel 4600,- €), some complete mint never hinged sheet and so on. Favorable! 2730 x BERLIN - extensive lot packed in a carton with numerous issues on stock cards and album pages. As well a good part beginning years with 1 DM red overprint on beautiful letter piece, all Freedom Bell sets mint never hinged, men 1952 mint never hinged, further mint never hinged bells issues, complete volumes and so on. Favorable valued!